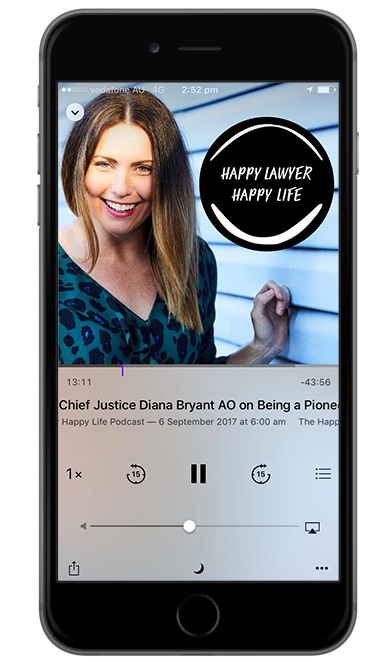 In this week’s episode of the ‘Happy Lawyer Happy Life Podcast’ I had the pleasure of interviewing the wonderful Linda Ryle. Linda is an Aboriginal woman of Birrigubba (Bowen Qld) and Kamilaroi (Monaro NSW) heritage who has devoted her career to ensuring that cultural intelligence and context is applied in consideration of Aboriginal and Torres Strait Islander people’s representation within the legal system. I loved this interview. Linda is someone that will make you smile, even as she speaks so frankly about the many challenges faced by Indigenous Australians, past and present. It is her optimism that had me smiling and absorbing her every word and I sense is at the heart of her happiness too. Linda had perhaps an unconventional start in the law. It was an administrative role at the Aboriginal Legal Service that first exposed her to life in the law. Having not have completed High School, the idea of starting a degree later in life may have seemed daunting and out of reach to most but I think that fact that Linda, who was by then juggling being a single mum as well, worked her way through her law degree and out the other side, says so much about the person that she is! Linda has spent her career advocating for Indigenous Australians and being a positive voice of change. These days Linda wears many hats but importantly is the Chief Executive Officer of CALM – ‘Cultural Advocacy and Legal Mediation’ and CALM assist 100% owned, operated and directed by First Nations Women. I found this interview inspiring. Linda’s deep intellect is obvious but she manages to take such difficult and challenging topics and explain things so clearly and simply. I think much of her comments were summed up when she said ‘Words without actions are a mere collection of letters and there are a lot of letters floating around’. I get the sense Linda has and will continue to be responsible for so much action. She is another happy lawyer and attests to being present, giving and being grateful (along with much time in the garden) as what keeps her happy in life and law. Growing up in Bowen in North Queensland. Moving to New Zealand as a teenager to live with her mum Linda left school and started her first job in hospitality. Linda returned to Bowen and found her way into law, taking an administration role at the Aboriginal Legal Services. It was on the encouragement of a mentor that Linda found herself studying law. Linda’s experience working at the Aboriginal Legal Service both in Bowen and later in Brisbane. The cultural considerations that are needed when working with Indigenous Australians. How we, as lawyers and professionals can learn to connect with the Aboriginal and Torres Straight Islander communities. The gig economy we all live in now and what this means for lawyers young and old! The importance of cultural intelligence. Some of Linda’s many learnings thanks to her Dad. The challenges Linda has faced working with the Aboriginal Legal Service & how she has tackled them. The importance of advocating for change and Linda’s many volunteer roles on committees that sit at the heart of much of her work. Linda calls on us all to have the courage to challenge those around us in positions of power, particularly our politicians as we consider the representation of Indigenous Australians in the legal system. Answering my question of ‘What can we do to help’? and Linda gives us her perspective on how we all can help with these very important issues. Domestic violence within the Aboriginal Toris Straight Islander communities and being comfortable with change and learning. Linda’s current project ‘CALM and CALM Connect’ and tells us how these programs are building good allies. The courage that is needed for change. The power and drive of Aboriginal Torres Straight Islander women particularly and the work force. I am so sure you will enjoy this powerful conversation with another wonderful and happy lawyer Linda Ryle.